There are a lot of options for your Subaru maintenance and repair throughout the Central Valley and we appreciate your taking the time to visit our Subaru Service Department serving near Cameron Park, CA. The experts agree that keeping up with regular automotive maintenance is the most cost effective way to get the most from your ride and no one knows your Subaru like the factory trained experts in our Service Center. We regularly update special service offers so you will save even more when you have us take care of your automotive maintenance and repair, but that's only the beginning. 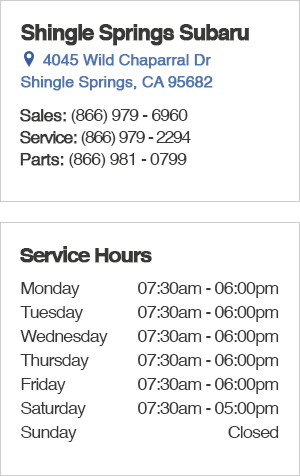 We know that your vehicle may not always work with your schedule but we will. Give us a call at (866) 979-2294 to schedule your Subaru service, maintenance, and repair and see just how easy taking care of your ride is at Shingle Springs Subaru just a short drive from Diamond Springs, CA. Getting the most from your Subaru means taking proper care of it and we are here to help with updated specials and exceptional customer service here at Shingle Springs Subaru. Take the short drive from Placerville, CA and discover how easy it is to get everything you could need for your Subaru in our Parts Department. Our parts specialists are a great resource to help you get exactly what you need so you're not running back and forth while regularly updated Parts Specials save you money. Those who would rather leave the dirty work to the experts will appreciate the peace of mind that comes with knowing their vehicle has been well cared for by the factory trained experts in our service center. Our state-of-the-art service facility is not only staffed with experts that know every inch of your Subaru model, you will also find frequently updated Service Specials to help you save even more money. We are conveniently located just east of El Dorado Hills, CA so stop by and see the difference at 4045 Wild Chaparral Drive, Shingle Springs, CA 95682 where we make buying a Subaru easy. We'll see you soon at Shingle Springs Subaru. Shingle Springs Subaru takes your privacy seriously and does not rent or sell your personal information to third parties without your consent.